It’s often said that if you want to get a feel for the character of a nation, you should study the way it sells cars, soup and mobile phone plans. That’s not to say that glossy ads peopled by implausibly good-looking and cheerful people are an accurate reflection of real life in America; rather, it’s that the ads show an image of people that Americans are willing to tolerate. And this year that image changed fundamentally. Marketing in America had long been moving towards including more lesbian and gay characters in advertisements, but 2015 will go down as the year that the US Supreme Court legalised gay marriage and that ads reflecting this sea change in the American idea of family went mainstream. When a steadily rising number of leading American brands start producing ads depicting lesbian and gay couples, it’s fair to say that something significant is going on. This year the likes of Campbell’s Soup, Wells Fargo, General Mills, Chevrolet, Hallmark, Honey Maid, Kohl’s, Tylenol and even Allstate, an insurance group, have come out with LGBT-inclusive commercials and social media campaigns. A spot for Campbell’s Soup’s special-edition Star Wars cans, for example, depicts two fathers feeding their toddler son and taking turns to do their best impressions of Darth Vader’s “I am your father” line. Corporate America Has No Option But To Join The March To Equality, The Times business section. Quite perceptive, though the title says it all. See also, A Momentous, But Conservative, Win For Gay Rights, Bloomberg on the US Supreme Court's equal marriage ruling. 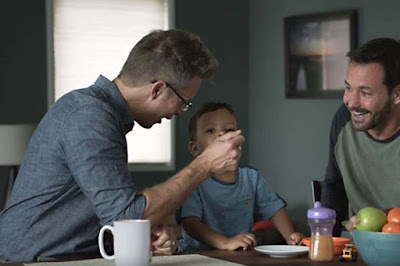 PS Fagburn thinks all these gay dad ads are AMAZING and ADORABLE etc, obvs. Update: Advertising Age choose their top 10 LGBT-themed ads of the year; 'Family values, transgender issues set the tone'. No surprises there, then.